Take the idol, if you dare! Starring Nobody Knows; my money's on Shia Labeouf. Casual game maker Imangi Studios has made a small fortune from Temple Run, and now it's set for even greater fame. Warner Bros. is on the verge of picking up the game for a big screen debut, and David Heyman, the producer behind all eight Harry Potter films, is already on board. If this goes ahead, it will be the second recent project Heyman has with Warners; the other, yet to be finalized, is J.K. Rowling's Fantastic Beasts and Where to Find Them. You needn't worry about seeing this at a theater near you just yet, as Temple Run hasn't got a scriptwriter, let alone a cast. Fortunately this sort of thing writes itself. Our Hero steals an idol from a temple, and is chased by demonic forces. See, you've got the Call to Adventure, Crossing of the First Threshold, Road of Trials and the Belly of the Whale, without even trying; all you need now is some form of Supernatural Aid (no, the demons don't count) and maybe a very brief Refusal of the Call. Job done! Well, mostly done. Congratulations are in order for Imangi, the three person studio founded in Raleigh, N.C., whose app skyrocketed into popularity. This time last year it announced that Temple Run had been downloaded more than 100 million times, and played 10 billion times since launch. 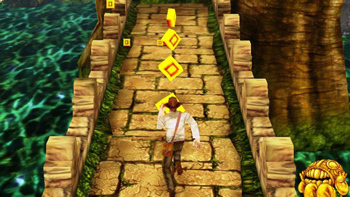 Its successor, Temple Run 2, hit 20 million downloads in just four days. Now a movie? Just goes to show: running from demon monkeys pays off, big time.